Slot Review: Jackpot Big Top Mobile Slot From Mr Spin -- Free £5! Jackpot Big Top mobile slots delights with its graphics and excellent features! Keeping their release schedule busy, Jackpot Big Top is the next big exclusive slot release from Mr Spin Casino. Mr Spin build all their slots in house, they are made and hosted all from the same single casino. 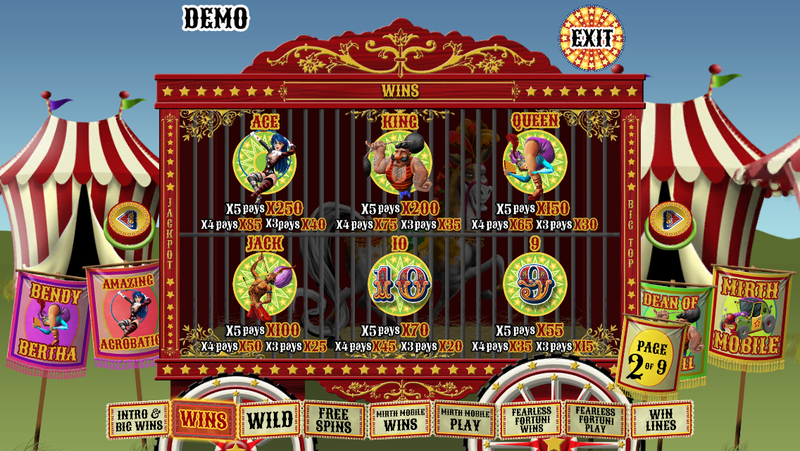 Jackpot Big Top is their circus themed exclusive slot, that is only available for mobile download from their site. Their slot releases have been bonus packed, original and even contain built in progressive jackpots to give the potential for some huge cash prizes. Even with their short stay in the industry, can Jackpot Big Top hope to compete with its predecessors? Read our review to find out! In terms of what’s on offer here, players will be surprised to find an impressive amount of bonus rounds, for an exclusive slot. Slots made for a single company are usually a very low key affair, but when it comes to their releases, Mr Spin have gone all out. Jackpot Big Top comes with three bonus features in total, which includes a prediction game, a pick and collect bonus and a extra spins round. Extra spins and pick and collect should be familiar to most players. In the pick and collect, players get to choose from a random set of lions, which all hide different cash prizes. Their extra spins round gives you a number of extra spins, depending on how many symbols you span in one go to activate it. Its prediction game is probably the most unique feature that the slot has. Called Mobile Mirth, the bonus round asks you to predict the number of clowns that will leave a car, from between 1 – 10. You win money if you get it exactly right, or if more clowns exit than you predicted. You only fail if less clowns exit the car. The lower you predict, the less you win, but you also give yourself a higher chance of winning each time. In terms of bonus games, it’s original and gives you much more of a choice and strategy than most slot bonus games could offer. Jackpot Big Top benefits from being a mobile only slot, which means that it only had to be optimised to work on a single platform. Mr Spin have taken full advantage of that and created a slot game that runs really well and has absolutely no hiccups in functionality whatsoever. Jackpot Big Top also straddles a nice line in terms of performance of style. The slot may lack the high budget CG characters and glossy visuals that we've come to expect from modern slots, but it has an almost hand drawn look to it, which makes it stand out from the crowd. This has the added benefit of making it playable on lower spec mobiles, whilst also remaining pleasing to look at for extended periods of time. Along with its bonus games, Jackpot Big Top also features a progressive jackpot. Every slot at Mr Spin Casino shares a single progressive jackpot, made up of all the cash wagered and lost across all their slots. Usually we would only see this on a specific range of specially made progressive jackpot slots, that are designed with their progressive jackpot as their main feature. Jackpot Big Top and other Mr Spin slots come with the progressive jackpot as a simple extra addition. Jackpot Big Top never tells you how big the progressive jackpot has gotten, or if it’s been won. All you know is that if you spin the 5 progressive jackpot symbols required, you’ll win it. It’s a simple feature to add, but it increases the excitement and potential wins on the slot by a country mile and is a welcome addition. Want to play Jackpot Big Top? A circus fantasy, Jackpot Big Top mobile game surprises with the great features and generous pay! 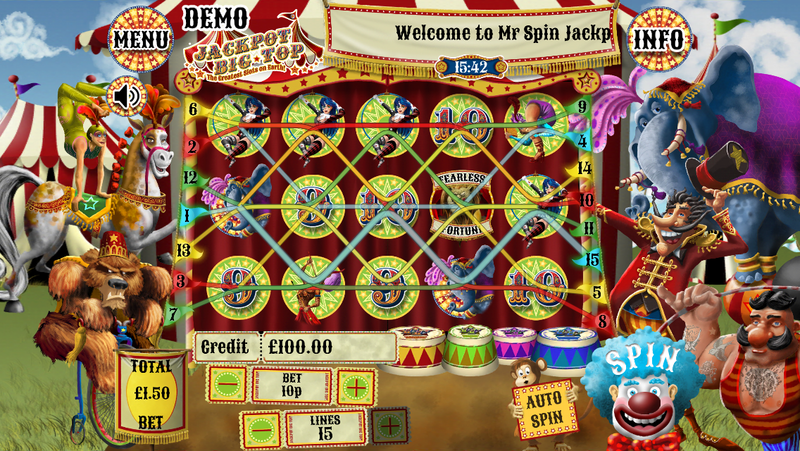 Jackpot Big Top Overall, Jackpot Big Top is another solid release from Mr Spin. For a casino that make all their own exclusive slots, it's a real treat for Jackpot Big Top to come out at such high quality as it is. It looks great, plays great and comes with 3 bonus features, which is more than a majority of most other bigger releases will ever reach. If you want a game that's charming, keeps surprising and can't be found anywhere else, then Jackpot Big Top over at Mr Spin Casino is the slot game for you.